The aims of the epic theater can be defined more easily in terms of the stage than of a new drama. Epic theatre allows for a circumstance which has been too little noticed. 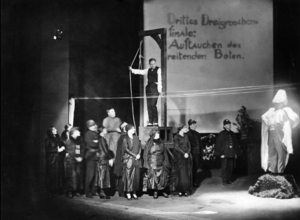 Brecht used on stage placards, slide or film projections, sound and lighting effects. The aim was to reject naturalism and draw attention to the artifice/infrastructure of the theatrical process. What if we draw attention to the artifice/infrastructure of the user’s interaction with the architecture? “Gestus”: at base this is an acting technique that relies on recognizable stylised gestures rather than spontaneous emotion, and which uses easily communicable symbols (a soldier’s gun, a woman’s cart, guillotine) to get the play’s message across to the audience. “Alienation Effect”: montage technique of fragmentation, contrast and contradiction, and interruptions. “Historicization”: Common production techniques in epic theatre include a simplified, non-realistic scenic design offset against a selective realism in costuming and props, as well as announcements or visual captions that interrupt and summarize the action. Using this epic theatre methodology, I’ll be focusing on threshold conditions. The threshold is the space in which the “Front” and the “Back” of house meet, interact, cross. By focusing on the threshold “on stage”, the spectators become an “active” participant, thus permitting performance.